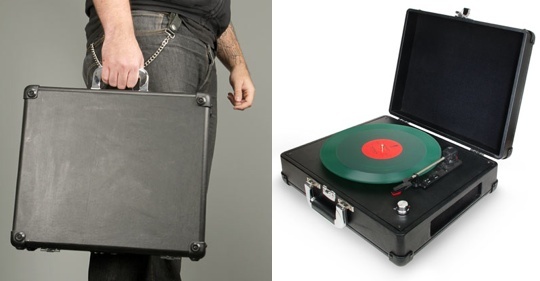 For record diggers who are all business, the Briefcase USB Turntable offers a way to preview the vinyl goods while still remaining somewhat inconspicuous. In addition to USB connectivity, the belt driven portable turntable features a fully automatic tonearm, tone control, and built-in speakers. $69.99 gets your own over at ThinkGeek. Cheaper than both the Handy Trax and PT01 but looks cooler. Not really convenient for digging though due to its size. Hey there great website! Does running a blog like this require a great deal of work? was hoping to start my own blog in the near future. Anyhow, if you have any recommendations or techniques for new blog owners please share. Thanks for sharing your thoughts on portable turntable. Quality articles or reviews is the main to invite the visitors to go to see the web page, that’s what this website is providing.